The warming climate is driving noticeable changes in ecosystems worldwide. Some of these changes, such as shifts in the geographic distribution of forests, can generate feedbacks to the climate, through effects on carbon, water and energy exchange with the atmosphere. At the same time, conversion of natural ecosystems to intensively managed cropland can directly affect the climate, potentially masking local effects of large-scale climate change. In this talk, I explore important linkages between climate and ecosystems, as well as some of the innovations in field experiments and modeling required to more accurately capture how ecological dynamics influence the climate. These interactions have important implications for everything from managing water shortages during drought to reforestation and afforestation under a directionally changing climate. 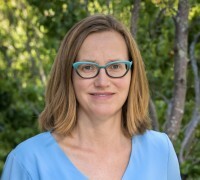 Lara Kueppers is a scientist in the Climate and Ecosystem Sciences Division at Lawrence Berkeley National Laboratory and in the Sierra Nevada Research Institute at UC Merced. She uses coupled climate-land surface models at regional scales, global change field experiments, and diverse observations to study climate-ecosystem interactions. Her interdisciplinary research interests include the impacts of climate change on plant populations, communities and ecosystems; climate-ecosystem feedbacks; plant and microbial species effects on ecosystem processes; agriculture-climate interactions; and economic and policy responses to climate change.